Besides coatings, linings are applied very often in the field of industrial corrosion protection and the rubber lining is one of the oldest kind of protecting installations. Rubber lining means the application of precut strips of the rubber chosen which are applied onto the substrate by means of a special adhesive. Suitable substrates are steel and concrete surfaces taking into consideration special rules regarding the construction and the condition of the surfaces. Basically we distinguish between hard rubber linings and soft rubber linings which can be used as workshop rubber lining in the workshop and as on-site rubber lining on site. 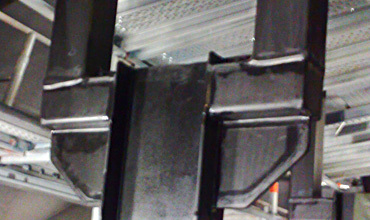 Whereas with workshop rubber linings the lining material is applied in an unvulcanized condition onto the component to be protected and afterwards being treated by means of temperature and pressure in the autoclave, for the on-site rubber linings other kinds of rubber lining treatment are used due to the size of the components. Here, mainly pre-vulcanized or self-vulcanizing rubber sheets are applied. Rubber linings of Reko Korrosionsschutz GmbH are applied as permanent protection against high chemical and thermal stresses, beside others, in storage and process tanks, reaction columns, scrubbers, pipes, transporation tanks, pickling tanks, ducts, pits, collecting basins, acid towers etc. In case of extreme thermal, mechanical and / or abrasive stresses a combination with ceramic tiles / bricks are standard. Especially the on-site rubber lining demands very high precision during application and that is why corresponding skilled competence and experience are required. The skilled fitters of Reko Korrosionsschutz GmbH meet all the necessary capabilities! A typical field of application for on-site rubber linings are flue gas desulphurization plants (FGD plants) with their high stresses. Here, self-vulcanizing rubber qualities with the adequate adhesive systems are often applied. In addition to the application in processing plants we also use our rubber linings in swimming pools of private or communal customers for the permanent sealing of the pools and the surrounding areas.